We are a certified gluten-free restaurant! We field a juice bar, smoothies bar & espresso bar as well as breakfast (served all day!) — plus wraps, sandwiches, salads, soups, quiche and more. Please note that we serve healthful, fresh, made-to-order food — not fast food. No need to be in a rush! And we appreciate your patience. 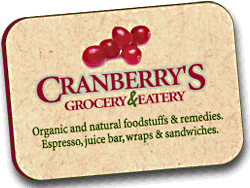 To keep prices down, we use combinations of natural, organic and conventional ingredients. However, nothing in our cafe contains neither trans fats nor high fructose corn syrup. We also serve Polyface Farm eggs, sausage and quiche. Both indoor and outdoor seating are available, as is take-out. Phone in your order (540.885.4755) and we’ll have it ready when you arrive. Come early to get a good seat. If you’re planning for a group of 20 or more in our upstairs meeting room, please consult the Catering Menu.